The interpretation of functional safety and the final draft of the International Standard ISO 26262 affect the automotive industry massively. 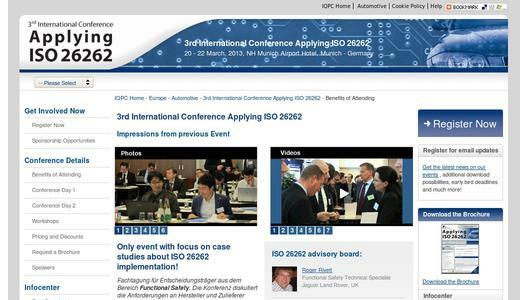 In 2013, experiences with ISO 26262 requirements and its implementation will be discussed at IQPC’s conference “Applying ISO 26262”, 20-22 March 2013 in Munich. Learn from eight OEMs and seven Tier1 companies how to deal with the most common challenges of the standard and find solutions how to overcome them. Additionally, conference participants are invited to attend three different interactive workshops on Friday, March 22. Please refer to www.iso26262-conference.com for more details on the program and footage of the previous event in March 2012.